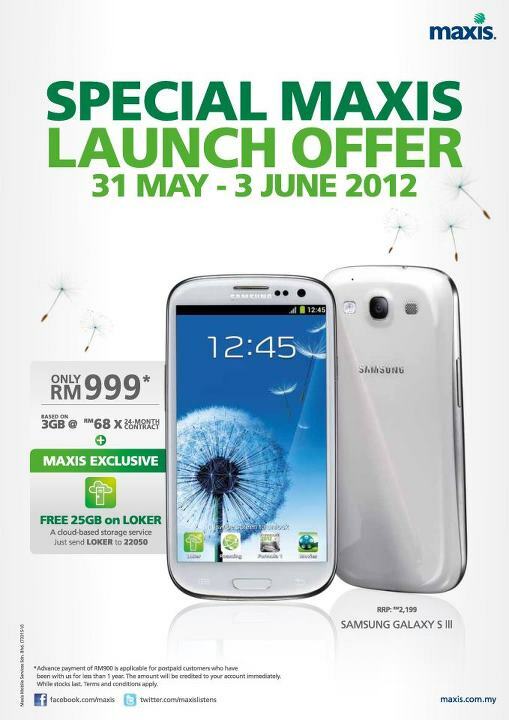 [UNCONFIRMED] Maxis’ Galaxy S3 Promotion Leaked? Looks like a leaked pic has surfaced on the Internet which shows the Samsung Galaxy S3 Plans from Maxis, the last player to come out with their plans for the phone. The picture was not on their Facebook or twitter at the time of publishing so there is always that question of legitimacy. The offer states that Maxis users can get the Samsung Galaxy S3 for a cool RM999 on a 3GB plan at RM68 per month for 24 months which is aligned somewhat with the DiGi Smart Plan 88 deal. On top of that, you'll get 25GB of space on Loker (The Maxis cloud based storage) free! For postpaid customers who have been with Maxis for less than a year, you will need an advance payment of RM900 and that amount will be credited back to your account immediately. For now, we can't say for sure if this IS the Maxis promo, but it does look pretty legit. So with the Maxis plans out, which do you reckon is the best? Thanks @lonelyfrog88 for the heads up!